The plot revolves around biotechnology researcher Kal Morrow and his son Saul. When his father is kidnapped by the evil Chimera organization, Saul uses one of his father’s inventions to turn himself into a wolf-human hybrid (so a werewolf then) to defeat the Chimera and rescue his father. 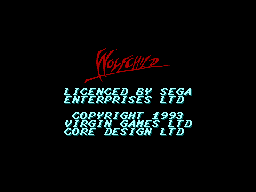 First some history; Wolfchild was developed by Core Design for the Amiga and the Atari ST. 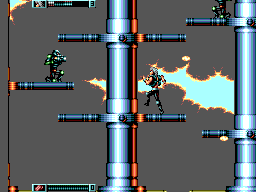 It was then ported on to other consoles including the SNES, Mega Drive and Sega Mega CD. The game was launched in 1992 and by that time the Master System was well in to its death robes in the US and Europe so it's surprising therefore that the game was developed for the ageing system. 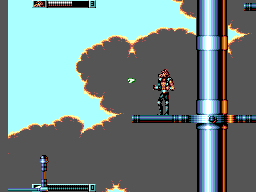 Development time meant that the more modern versions had been out a full year before the Master System’s European release of the game which arrived in 1993. So was this just a quick buck for Core Design and publisher, Virgin? There’s always a problem with adapting a game designed for the latest consoles to an earlier console and that is you are left with a shell of the original game. This does not necessarily translate in to a bad game however. Sadly this is the the case with the Master System adaption of Wolfchild. Playability-wise, things are a bit up and down. It’s a classic action platforming game and in this respect it does have quite an extensive level design with which to traverse as well as a plethora of secret caverns to discover. I will admit that a few times I did get immersed in it but it never lasted and that was thanks largely to the terrible controls. You have to collect power-ups which allow him to transform in to the werewolf/Wolfchild and I can’t help but feel a bit of an Altered Beast vibe at times. There are a variety of bad guys that stand in your way but most of the time they don’t move. They just stand there firing the odd round in your direction like some kind of robotic sentry. Your biggest threat comes from things like exploding plants but even these are relatively ease to dodge. I will give it this - the look of the game is excellent. The opening screen is beautifully drawn and the level designs are extraordinarily detailed for a Master System game. In the looks department it really shows what Sega's 8-bit console can really do. The first thing that I noticed was that there was no music. What kind if game like this has no music? I was expecting to be thrown in to a world of horror and action but instead I have just little blip sounds as he walks and the usual paper crushing sound when a weapon is fired. I know the Master System wasn’t exactly known for its audio capabilities but there were far better sounding games out there well before 1993. I was so stunned by the lack of music that I thought the cartridge was broken (it is 19 years old after all) and so I took out my phone, went on YouTube and looked for videos and sure enough there is no music on the Master System version. This was a big let down and made the game feel flat. I know he is supposed to be a werewolf/Wolfchild, an untamed creature of the night, but I swear sometimes the game decides to just keep him running even when you have taken your thumb off the D-pad. Naturally this can lead you to all kinds of problems and takes a bit of getting used to. The platforming is fairly solid however. I blitzed this game through a week usually playing about an hour or two at a time. After that I haven't really picked it up again going back to beloved favourites. I occasionally look at it again but my heart isn't really in it and it never stays on for more than twenty minutes. On the whole not a very good game but I can see the lost potential from the downgrading. I have checked out some more videos on YouTube of the versions for the newer consoles such as the Mega CD and it does look far better. Maybe this was too much for the Master System to adequately replicate or the publishers just wanted to make that quick buck in the final days of the Master System. Either way this felt like a step back to some of the 1980s era games of the Master System albeit with a slightly better look.